Sleeping/Routine – She is still in her room and since we come back from our Summer Holidays in Germany (touch wood) she has been sleeping through the night IN HER OWN BED without her normal 4am visits to crawl into bed to cuddle and sleep with mummy, which is rather nice. But unfortunately we are back to lying down to fall asleep and it doesn’t matter if we stay for 15 or 30 minutes she will wake up again and cry that we leaving her. Somehow Daddy is starting to trick her into thinking its her idea that he is leaving the room now but sadly that doesn’t work for me. She is still having a 1.5hr nap (and sometimes even a 2hr one after nursery) at lunchtime but she is starting now every other week to refuse to go to sleep but is pretty cranky come 4.30pm so she is defiantly not ready to drop the nap just yet which is fine by me! We are slowly starting to wean her off the dummy and trying to only use it for nap and bedtime and when she gets really tired 9about 30 min before its time for bed) which works pretty well! I do want to go cold turkey with it eventually and let the dummy fairy come and get them. Potty Training – Before the summer holidays she showed signs of trying out the potty so we encouraged her to use it and go on the toilet but its on and off due to her ongoing constipation problem which is apparently very common in girls age 2-3 years she is on CosmoCol on and off to regulate it and hopefully it will go back to normal soon! She is using the toilet before bath time and sometimes before bedtime and she always takes of her nappy once she has done a wee and brings me a fresh one to put on same with her telling me that she did a Nr. 2 and she wants to be changed so i think full on Potty Training mode isn’t too far away!! Weight – She’s 15 kg now and is wearing 3-4 years clothes for quite a while now. Favourite Toys – Her IKEA toy kitchen is still a firm favourite of hers especially when she sees Daddy or me cooking then she is off to copy us! Although she is still playing with her Peppa Pig play sets the Frozen fever has hit the house. From watching the DVD to playing with her little Frozen figures its all about Anna (her favourite) and Co! She adores feeding her dollies and taking them for a walk/putting them to sleep! She started to play dinosaurs and Lego with Finn and its amazing to see how many different dinosaur species and Lego figures she knows the name of when you ask her! Likes/Dislikes – She absolutely loves to draw and comes home with about 3-4 sheets of paintings from nursery on the 3 mornings she is attending. Dancing and especially accompanied with loudly high pitched singing is still a favourite of hers and she mainly likes to do that in public or as you can see in the video below in the waiting room at Finns Swimming Lesson. paint and mud a nice “party” dress can take! 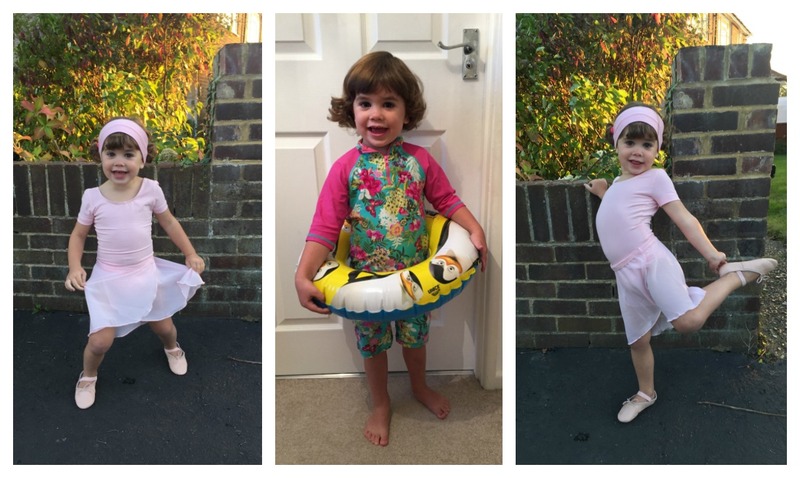 Swimming/Ballet – After our late summer Family Holiday to Mallorca she finally started her 2 new classes and was in particular VERY exited to start ballet. When we got there and she saw the other girls wearing tutus just like her (she hasn’t received her proper ballet uniform at that point so a frozen tee and a red tutu did do) she run up and down the hall singing “i am going ballet, i am going ballet” and all the way through the class she beamed and was overly exited and maybe not as good with listening as i wished she would have been! to learn it because i regret not starting Finn until he was nearly 3 years old. 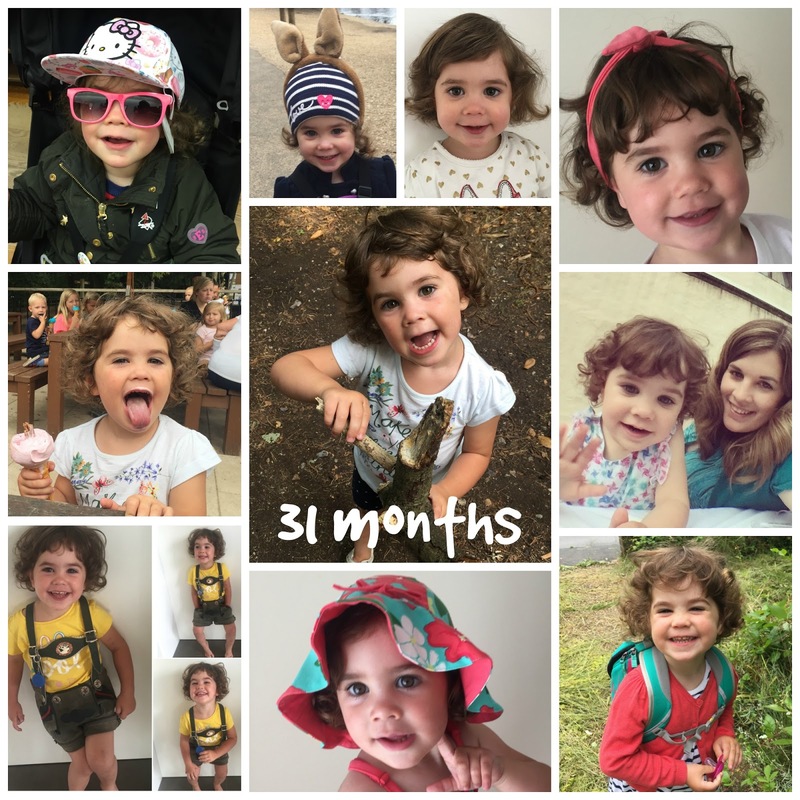 Talking – Its lovely to hear her trying to say full sentences and telling us what she has been up to at Nursery or explaining to daddy what she did at swimming. She comes out with the most random stuff at times, well maybe not that random in children’s eyes but its just hilarious! For example last weekend we went on Uncle Marks boat “Piper” and once we returned to the marina after a trip up and down the Thames there was a boat passing and she shouted “Woooow, that’s a big boat!” which had us all in stitches except Uncle Mark who ask her if his boat wasn’t big enough? Opa. wo ist mein Wurstbrot? – Opa, where is my bread with (sliced) sausage? Getting my Boots on – Thanks to Brantano!